Tofu Jerky. It’s what’s for lunch. It’s been a long time since I made tofu jerky. Life got in the way. And the last time I tried to make it, well, it went wrong. I didn’t use a strong enough marinate and the tofu went bad. It was nasty. Anyway, despite all that, and this blog getting hacked more than once, I still have one of the top 10 links for Tofu Jerky on my old page (chairthrower.org/tofujerky) but If you go to the link for the original recipe it’s all there now. The kids are excited about it–it’s been so long, the kids don’t even remember having it. 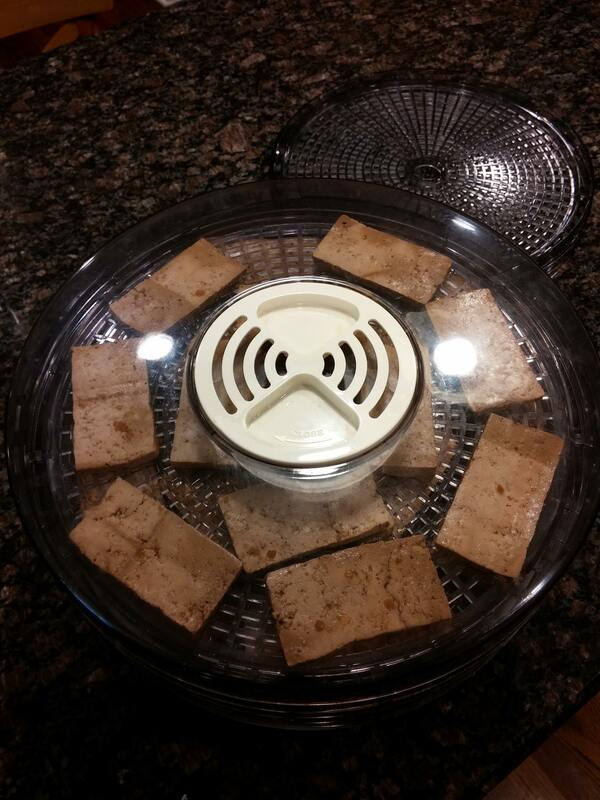 Our 6 year old did not remember seeing the food dehydrator before. I’ll probably make the stuff more often now. I’ll also do some tweaking to the recipe. 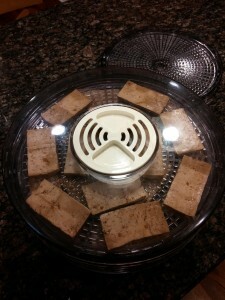 I now realize I can probably get about 4 pounds of tofu at once into my food dehydrator, and I could do different recipes at a time. Just looking around the net at some of the other recipes that have sprung up in the last 5-10 years, there’s experimentation to be done with smoked paprika, tomato paste, etc. Perhaps I can regain my rightful place as the leading tofu jerky site on the net. It may be an uphill battle, but I will try. Next Next post: Tofu Jerky. It’s what’s for lunch.